The building's principal line traces the passage of mourners from their arrival, continuing via this chapel to the cemetery, then circling back to a room where coffee is served. Along this route the mourners experience something of the building itself and the different spatial conditions in and around it. Colour, material and an abundance of daylighting distinguish this building in a positive way from the dark, formal spaces usually encountered at such places. 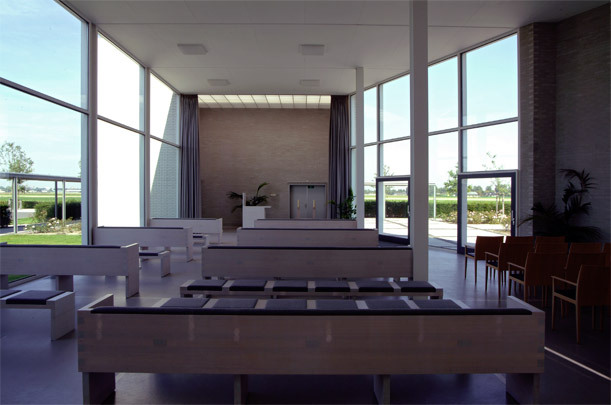 When a new runway needed building at Schiphol, the cemetery was moved from Hoofddorp to Zwaanshoek where the chapel has been meticulously reconstructed.